Yes, this is a special, early Weekly Update to announce the launch of Pinnacle Entertainment Group’s Rifts® RPG game line for the Savage Worlds game system. Plus, we have a one week Palladium Rifts® sale to help kick off the launch for the Savage Worlds Rifts® Kickstarter. Read on. The Kickstarter launched at noon Eastern time and made its goal in two and a half minutes! It is now rocketing to new heights. Awesome. Check it out. Pinnacle is helping to expand the Rifts® Megaverse® by adapting Rifts® to their award winning Savage Worlds game system. The adaptation is a labor of love created by people who know Rifts® and care about its fans. Thank you Sean Patrick Fannon and Ross Watson – and congrats to Shane, Jodi, Aaron and everyone involved in this exciting project. I have enjoyed reading everything I have seen from Sean and Ross. They have been masterful at capturing and encapsulating Rifts® for people who have never played, while making it fun for us who know Rifts® inside and out. The color artwork throughout is pretty awesome, too. Seeing all of this has made me excited about Rifts®, and I created this world! Make sure you check out the cool, limited time Kickstarter items, too. 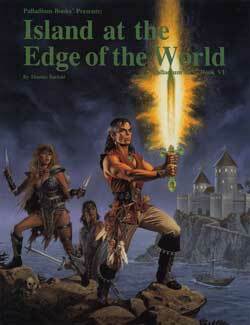 Blend Palladium’s Rifts® source material with Savage Worlds and vice versa. Palladium’s Rifts® fans and collectors may want these full color, well written books just to read and own if nothing else, but there are all kinds of cool ideas, random tables and adventures you can easily incorporate in your current Rifts® games. Savage Worlds players can learn more about Rifts Earth right now or any time by picking up Rifts® Ultimate Edition and any number of World Books and sourcebooks. To make that easier, Palladium presents the Rifts® Savage Sale with core rule books and some notable sourcebooks as part of the savings. Enjoy. For you Savage Rifts® players anxious to dive into Rifts® – and for Palladium Rifts® players everywhere, we give you the Rifts® Savage Sale offering Palladium’s existing core rule book and a selection of notable sourcebooks. Many of which go hand in hand with Rifts® Heroes of Humanity™, HoH Arsenal™, The Disavowed™ and Haunted Tech™. Titles like Rifts® Megaverse® in Flames™, The Vanguard™ sourcebook, Coalition War Campaign™, and Siege on Tolkeen™ 6: Final Siege™, among others. We hope the sale creates more excitement about Rifts® and the Savage Rifts® Kickstarter going on right now. Enjoy and game on! Rifts® Ultimate Edition – Hardcover Core Rule Book – $29.96 sale price. 376 pages – everything you need to know to start playing. 30+ character classes; play a dragon, Dog Boy, Cyber-Knight, Techno-Wizard, Mind Melter and more. 150+ magic spells, 80+ psychic powers, Rifts Earth background, the Coalition and much more. Limited only by your imagination. Cat. No. 800HC. Rifts® Game Master Guide – softcover Core Rule Book – $20.21 sale price. 352 pages of game notes, information, power armor, vehicles, weapons, maps, lists, tables and indexes to assist Game Masters running Rifts®. Cat. No. 845. Rifts® Book of Magic™ – softcover Core Rule Book – $20.21 sale price. 850+ spells, 370+ magic items, Magic Tattoos, Nature Magic, Whale Song magic, Biomancy, Techno-Wizard weapons and devices, Rune Weapons, magic herbs, magic symbiotes, talismans, fetishes and more. 352 pages, Cat. No. 848. Rifts® Adventure Guide – softcover Core Rule Book – $18.71 sale price. 150+ adventure ideas, notes on campaign design and running games, and tables for creating cities, towns, mercenary companies, organizations, traveling shows, tables for different types of Rifts, and more. 192 pages, Cat. No. 849. Rifts® World Book 35: Megaverse® in Flames™ – softcover – $18.71 sale price. 50+ Soulmancy spells, 40+ demonic weapons and war machines, 14 lords of Hell and their armies invading Rifts Earth in the Minion War. 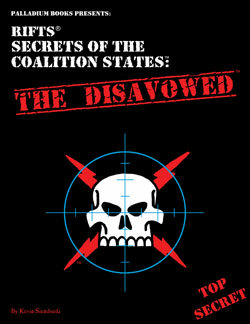 Can the Coalition and other heroes stop the demonic legions? 192 pages, Cat. No. 876. Rifts® World Book 11: Coalition War Campaign™ – softcover – $18.71 sale price. 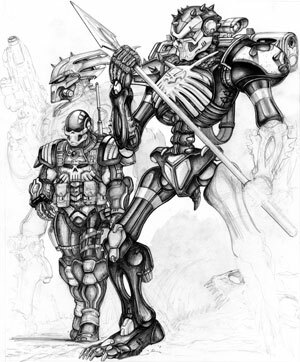 The title says it all, an in-depth look at the Coalition army, combat character classes, 30+ war machines (power armor, robots, armored vehicles, aircraft), plus weapons, Skelebots, body armor, 9 military O.C.C.s, rank, history, background, the Coalition police, the ‘Burbs, and more. 192 pages, Cat. No. 821. Rifts® World Book 10: Juicer Uprising™ – softcover – $15.71 sale price. 15 types of Juicers, their gear, deadly sports, Last Call, detoxing, background, history, adventure setting and ideas, betrayal and more. Epic. 160 pages, Cat. No. 820. Siege on Tolkeen™ 6: Final Siege™ – $18.71 sale price. 40+ NPC villains, more monsters and magic, Tolkeen’s secret weapons, warlords, magic items, a city of dragons and the city of Tolkeen (mapped), and adventure ideas – ALL suitable in the aftermath of the Final Siege and in the Minion War! 224 pages, Cat. No. 844. Rifts® Sourcebook One – softcover – $15.71 sale price. More on the Coalition States, robot creation rules, the introduction of Archie Three and The Republicans (NEMA troops from the past! ), robots, monsters, adventures, adventure ideas, and more. Archie and The Republicans play a big role in Rifts® Heroes of Humanity™ and Rifts® Haunted Tech™, coming soon. 160 pages, Cat. No. 801. The Vanguard™ sourcebook – softcover – $7.46 sale price. The Coalition States has outlawed magic. Its practitioners of magic are hunted fugitives. Yet, long ago, the CS once had mages in its army. The ancestors of those wizards remain loyal to the Coalition and work as a secret organization to protect the nation from other mages. Eight Vanguard O.C.C.s., their history, and more. The Vanguard play a big role in The Disavowed™, coming soon. 48 pages, Cat. No. 856. Rifts® Mercenary Adventures™ sourcebook – softcover – $9.71 sale price. 7 new Mercenary O.C.C.s, Combat Mage O.C.C. and combat magic, and Mercenary Boot Camp, training, bonuses, adventures and more. Just a fun book. 64 pages, Cat. No. 867. 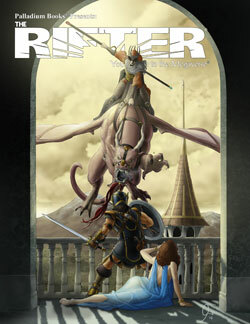 The Rifter® #73 – All OFFICIAL source material – softcover – $10.46 sale price. 96 pages of official source material for Rifts®, Palladium Fantasy®, Splicers® and other settings. It’s a great issue. 96 pages, Cat. No. 173. 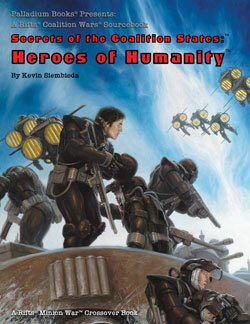 Heroes of Humanity™ is 160 pages of epic goodness, with ways to upgrade your existing Coalition and men-at-arms characters with Advanced Training, more on CS Juicers, Cyborgs, Psi-Battalion, plus some new ones like the CS Combat Courier and Death Knight Demon Hunter, CS strategies and tactics for fighting demons, Coalition secrets and more. This book changes the entire Rifts® landscape with ways for your adventurers, D-Bees and mages to fight alongside Coalition troops. Taking pre-orders right now. When we have an exact ship date, we’ll let you know. Working away on it. CS Heroes of Humanity™ Arsenal is the companion to the Heroes of Humanity™ Sourcebook. It is jam-packed with new Coalition power armor, robots, combat vehicles, and related goodies. Time to pre-order! See the description elsewhere. Rifts® The Disavowed™ should quickly follow CS Heroes of Humanity™ Arsenal. It expands the scope of adventures even further. Rifts® Haunted Tech™, Secrets of the Atlanteans™, and Rifts® Sovietski™ are all in development, along with some Palladium Fantasy®, Robotech® and Splicers® products. As we said in the last update, we are gearing up for more Robotech® RPG Tactics™, starting with material that will be made available on DriveThruRPG.com. Meanwhile, we are supporting all kinds of Robotech® RPG Tactics™ events at StrategiCon. More on that in the next update. Coming soon – Rifts® Ultimate Edition, but the Rifts® RPG 1st Edition rule book is available now. Also coming soon, Rifts® G.M. Guide and Rifts® Book of Magic. All of these are big books, which have been taking us a while to prep for PDF. All kinds of Rifts® World Books and other titles are available now. With so much going on and people getting sick, the number of new PDFs will stall for a couple of weeks before picking up again. Ah, but there are plenty of Rifts® and other titles available right now at DriveThruRPG.com! With more Rifts® and other Palladium game titles coming to PDF in the weeks and months ahead. Please join Palladium Books in the gaming hall where we’ll be selling Rifts®, Robotech®, Robotech® RPG Tactics™ and many other gaming products as well as displaying a wide range of artwork, running a few RRT demos and maybe even a role-playing game or two. Greg Diaczyk, Wayne Smith, Charles Walton II and a few other Palladium creators will be present to chat, sign books and enjoy some fun and games in Toronto with you. Oh, and Chuck and I will also be part of several panel discussions. Check the online schedule. Looking forward to seeing many of you there! As you might guess, we have all been busy working on a number of obvious projects, Rifts® Heroes of Humanity™, HOH Arsenal™, Robotech®, conventions and more. One of which included feedback and approvals for the Rifts® for Savage Worlds Kickstarter and game line. Our sincere congratulations to the good people at Pinnacle for a great job on adapting Rifts® to the Savage Worlds game system and for what’s looking to be a super-successful Rifts® Kickstarter. I have to say, working with them as a licensee has been a very pleasant and rewarding experience. Please spread the word about the Savage Worlds Rifts® Kickstarter, Palladium’s Rifts® Savage Sale and upcoming titles for Rifts® and other books. Thanks for the support and love. Have a great week and keep those imaginations burning bright. In final production! Rifts® Heroes of Humanity™ is the next chapter in the epic war for the soul of humanity. 160 pages – $20.95 retail – Cat. No. 889. May release. 96 pages – $16.95 retail – Cat. No. 893. May release (Tentative). In final production.